There are two types of Kogia. Kogia is a genus name and the two types (species) are the breviceps and the sima. The common name of breviceps is pygmy and the common name for sima is dwarf. These animals are called sperm whales even though they are much smaller because they too have the spermaceti organ located in their heads just like their much larger relative. One unique feature they do not share with the large sperm whale is a sac in their lower intestine that can hold approximately three gallons of syrupy, re-brown liquid. The dwarf and pygmy sperm whales will expel the liquid when they feel threatened as a defense mechanism. The liquid will cloud the water temporarily allowing time for the whale to escape. These are not very large whales. The pygmy sperm whale has a maximum length of eleven feet six inches and a maximum weight of nine hundred pounds. The smaller dwarf sperm whale has a maximum of eight feet ten inches and a weight of at least four hundred and sixty pounds. It is very hard to tell these whales apart, especially in the water. Their dorsal fins are different in that the dwarf has a higher more pointed fin which is set farther back toward the tail than the pygmy which has a more curved dorsal fin in the middle of its body. Their heads have a slightly different shape also. The pygmy sperm whales head is blunt and is more square. Mills eating in front of the scientists taking measurements. They are both a bluish steel gray color and have a pinkish line where a gill slit would be on a fish. 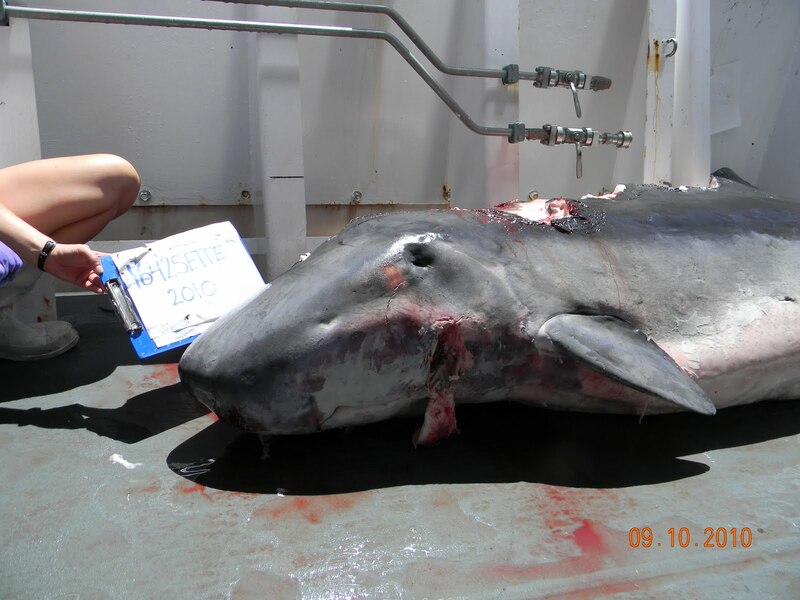 Because of this marking, the pygmy and dwarf sperm whales have often been falsely identified as sharks. Both species of Kogia can be found at great depths in the tropical and temperate latitudes. They are relatively widespread but they are not abundant. Despite their large range relatively is known about these species. It is hard to find these whales in the wild because they do not “show off”. They do not jump or move in groups together. Even their blow is faint if not invisible. Like the large sperm whales the dwarf and the pygmy sperm whales feed mostly on jellyfish, but also on shrimp, crab and fish. A number of these whales have been stranded and the necropsy showed a gut blockage caused by plastic bags. 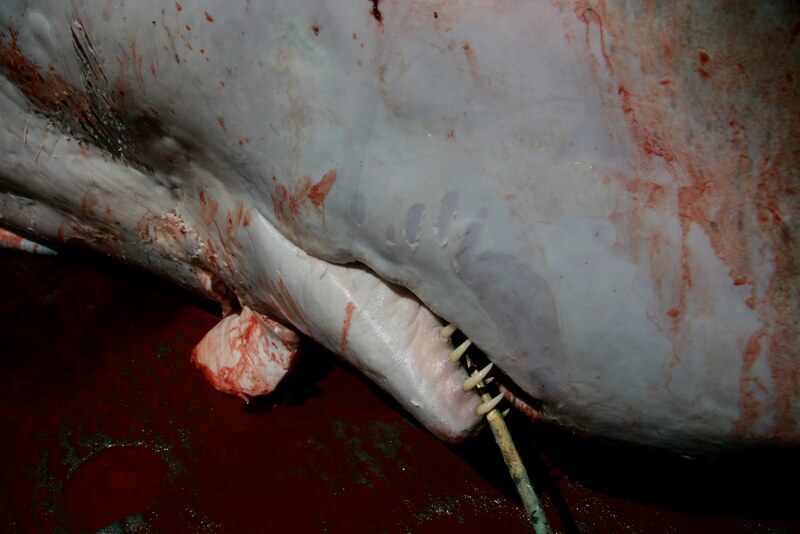 People usually do not hunt pygmy and dwarf sperm whales for food, but because of their size they are occasionally trapped in fishing nets. After lunch on the flying deck Allan Ligon, mammal observer, was viewing through the “big eyes”. He said he saw something green in the water and said it was probably the shadow of an underwater net. 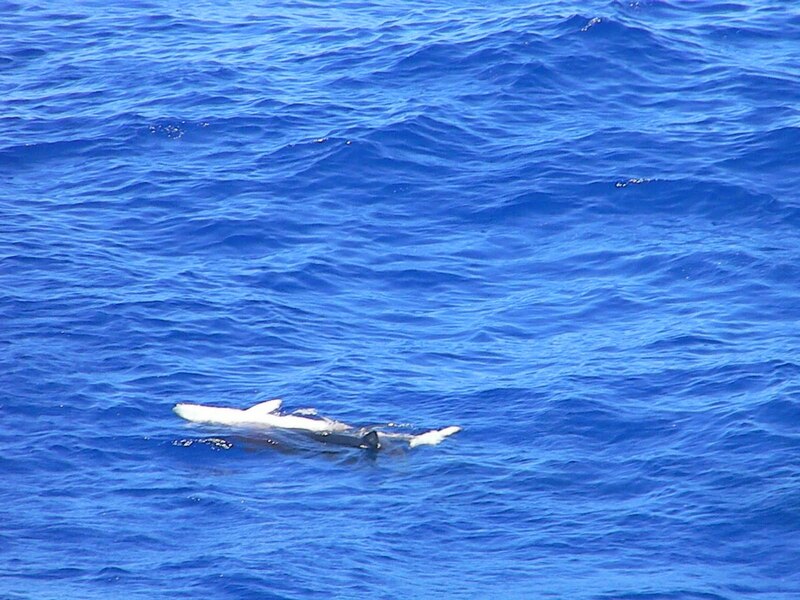 As the ship got closer to the object he thought he was seeing a dead shark. A few minutes later he realized it was a dead whale with sharks feeding on it. 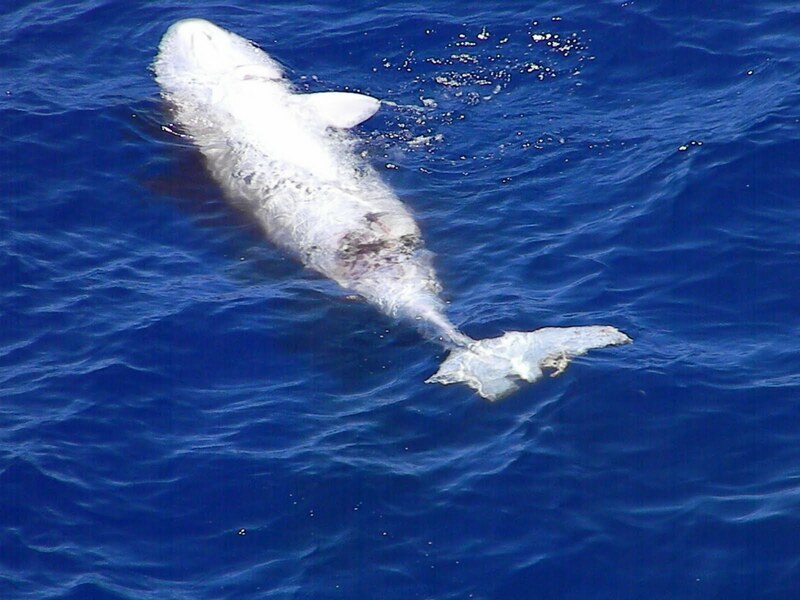 The green color was caused by the whale’s blood dripping from bite marks. A close up the head and pectoral fin. 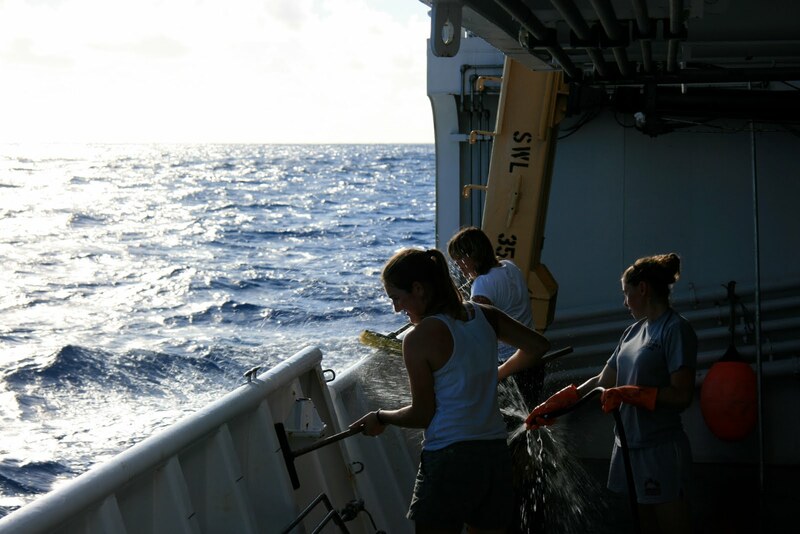 All scientists were on deck to watching viscous sharks. Sure we had all seen similar scenes on television but to see it happen in real life right before your eyes was amazing! There were at least two sharks and they would circle the whale and then attack it. Sometimes a sharks head would come out of the water for a huge powerful bite. Occasionally a shark would push the whale under and swim over it. It definitely reminded me of an animal claiming its kill as the ship approached closer. The whale was identified as a Kogia because the small mouth narrowed down the possibilities. It was either a breviceps, pygmy sperm whale, or a sima, dwarf sperm whale. Both species of whales are very elusive and are seldom seen on mammal survey cruises. Because there is a lot to learn about these whales, it was decided to bring the whale on board. Kogia’s teeth in it’s small lower jaw. Not only was the science crew excited at the extraordinary find, but every member of the ship was in attendance for the whale “capture”. All the officers, the stewards, the engineers, everyone was watching as the deck crew got prepared to lift the whale on the deck. The boatswain, pronounced bosun (which is a story in itself), had his crew gaff the whale to the side on the ship. (a gaff is a pole with a hook on the end) Once the whale was close enough a rope was tied around its tail and attached to a crane. The Kogia was lifted easily out of the water. By this time the sharks had given up to the much larger ship and were lurking nearby. With all the blood in the water everyone was being extra careful not to fall in! Once on deck the damage the sharks had inflicted became evident. 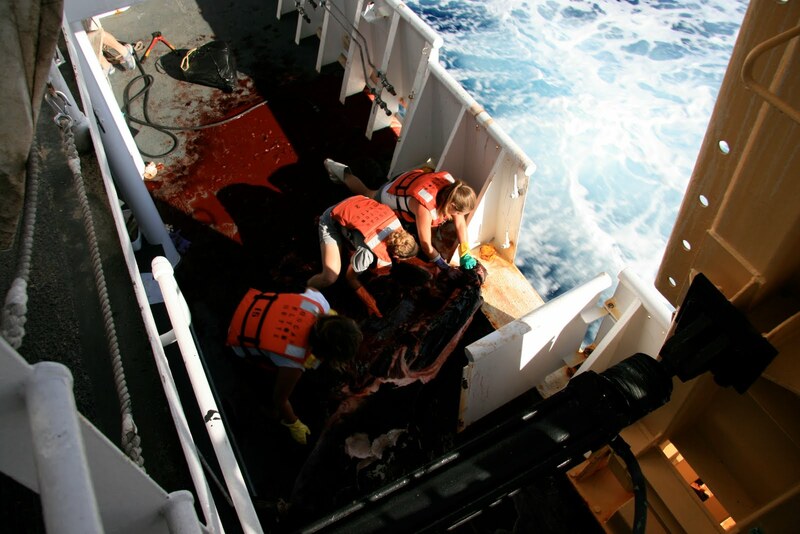 Large chunks were missing from the whale’s back, head and tail. Everyone was speculating what kind of whale it was, either the dwarf or the pygmy. Nicky, from the acoustics team, approached Erin the chief scientist and asked her if she could perform a necropsy on the animal. 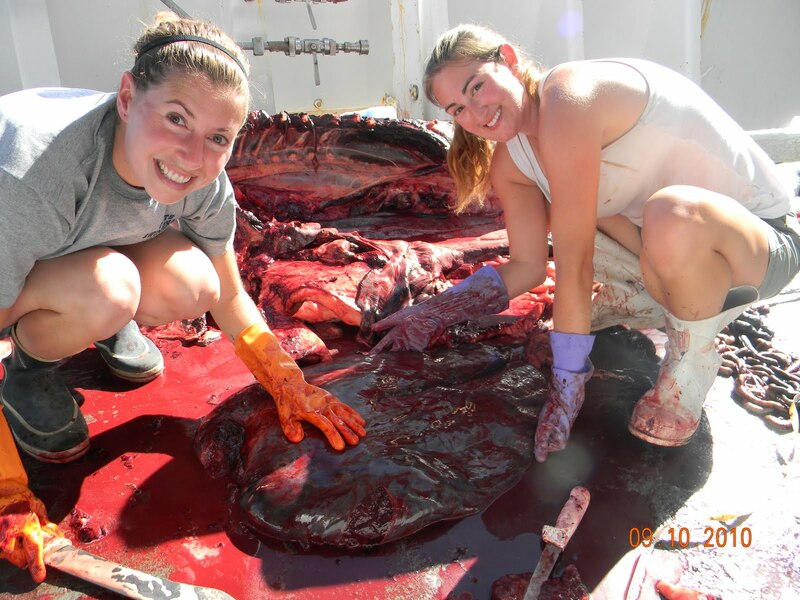 Performing necropsies is part of Nicky’s job description at Southwest Fisheries in California and she has worked on dozens of stranded whales, so Erin was happy to have her handle the sampling. The biginning of the necropsy. Nicky got together a kit for dissection and also the containers for the samples and off she went. 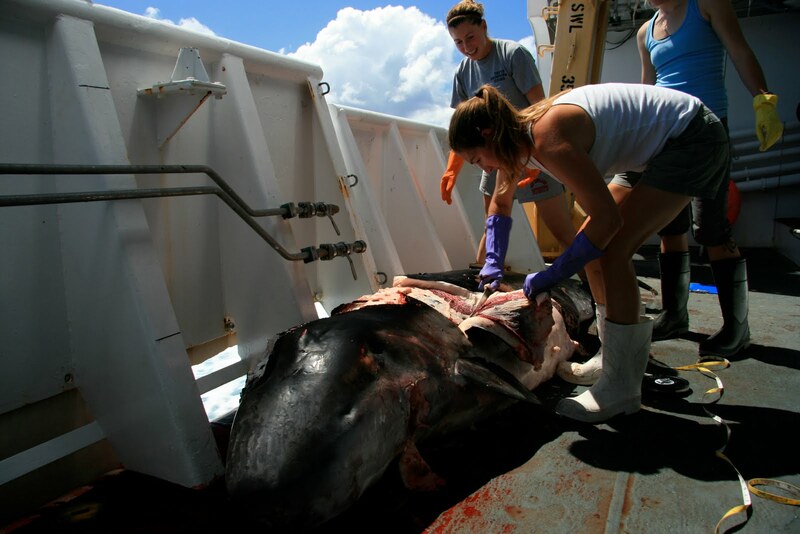 She had help from Aly Fleming, a grad student and visiting scientist, Corey Sheredy an oceanographer, Andrea Bendlin, mammal observer, and myself. We were all decked out in fishing boots and gloves. 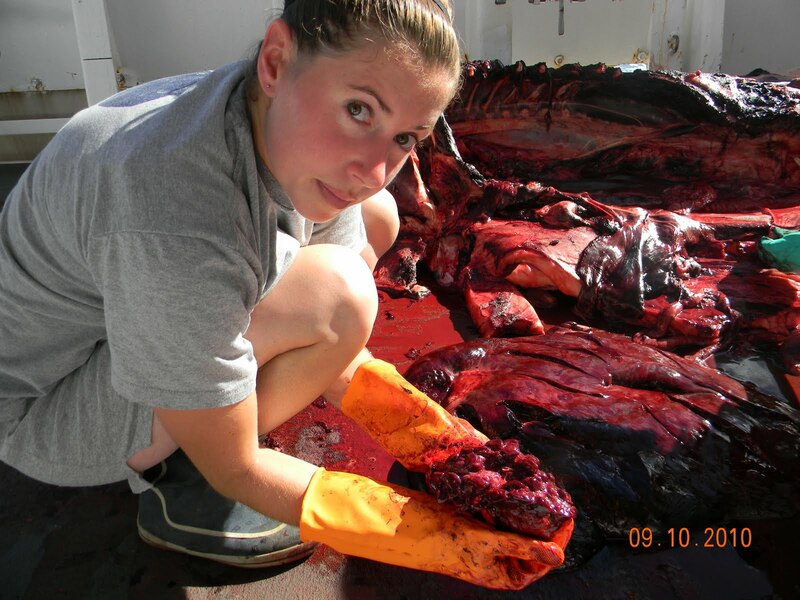 My chief job was to bag and label samples and to record data about the size and appearance of the whale “parts”, but I ended up using the scalpel and saw as well. This was a long process and eventually the working scientists had to go back to their jobs, but Nicky, Aly and I kept working until finished. It took over five hours to look at all the major organs and tissues. We took two samples of every organ. One sample will be sent to Hawaii and the other sample to Southwest Fisheries where Nicky works. In the case of the lungs and testes, (yes we discovered it was a male) we had to take a sample from both the left and the right. Aly and Nicky showing Kogia’s enormous liver. Nicky did not think the small intestine felt right. It was extremely hard and compact and felt there might be some kind of blockage as the colon was empty. She made sure to get a feces sample for the lab also. Wow what a highlight! Yes, I am being sarcastic. It is a good thing hands are washable. I couldn’t keep gloves on while writing and sealing bags. It sure looks he was a very sick whale in the digestive system! Nicky showed me some of the parasites she found in the tissue and also in the blubber. That was something I was surprised by but in hind-site all animals have some kind of parasite, even humans. There was foam in the left lung, much more than in the right. This could mean that the real death was drowning. 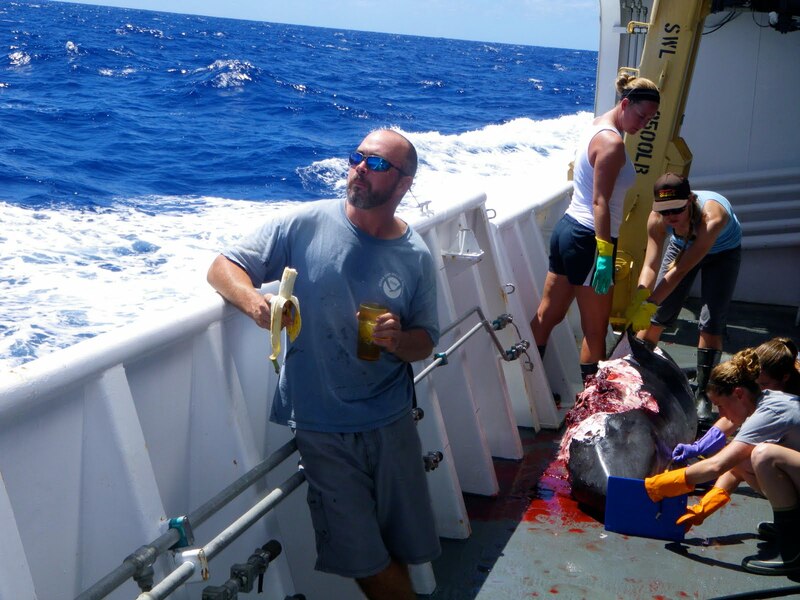 Whether it was from a blockage or a drowning, it seems likely the sharks came across a dead carcass rather than attacked and killed the whale. The actual results will come when the samples are processed in the lab. Aly holding the extraordinary liver. The Kogia’s organs are all very similar to ours, comparing mammal to mammal, with a few exceptions. Their stomach has three distinctive sections and the kidney has many bulbous sections forming one large kidney. I did not do any research of kidneys but Aly believes the old shape in the kidney is due to the complex filtration system needed to remove salts from the whale’s body. I asked the girls about the ears and they were almost impossible to find, but Andrea discovered one on the left side. It was a tiny pin hole behind the eye. Without specifically looking for it, we would not have seen it. We counted the teeth and there were twenty four (bottom only) which is normal. Feeding the sharks the remains. Nicky, Aly and I eventually needed to use a pulley, it was too heavy. Many people from all crew came to check on us, some even brought water. It was extremely hot and no breeze was felt the whole time. It sure was fun dissecting again and doing some comparative anatomy! The girls did a great job, at least from my point of view, they were very knowledgeable and taught me a great deal! Everyone seems proud to be on the Sette and be involved in the unusual tasks that this mission has undertaken. 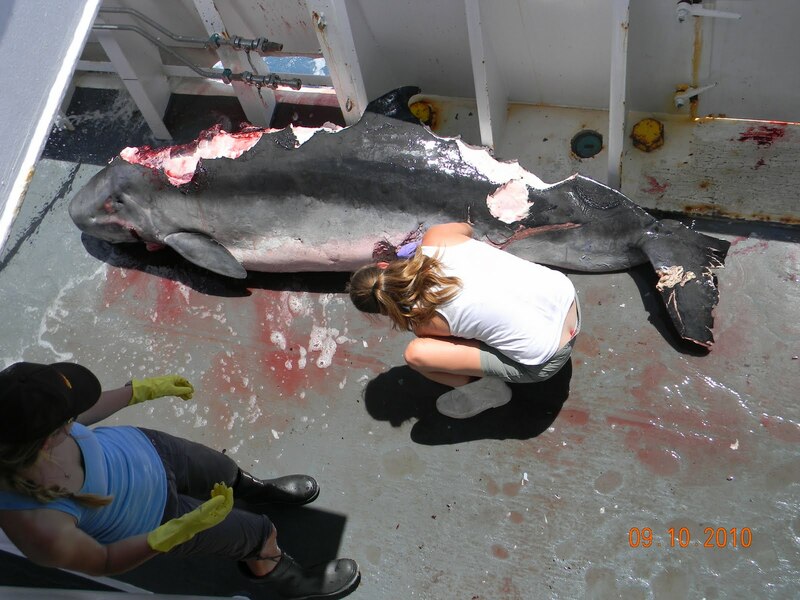 The remainder of the Kogia was returned back to the sharks and the huge clean-up began. That did not even feel like a chore as we were chatting about the findings the whole time. Cleaning up. Thanks Kogia for helping us learn more about you! The type of Kogia (species) will not be known for certain until the test results are in, but most scientists feel 60/40 it is a breviceps or the pygmy sperm whale. 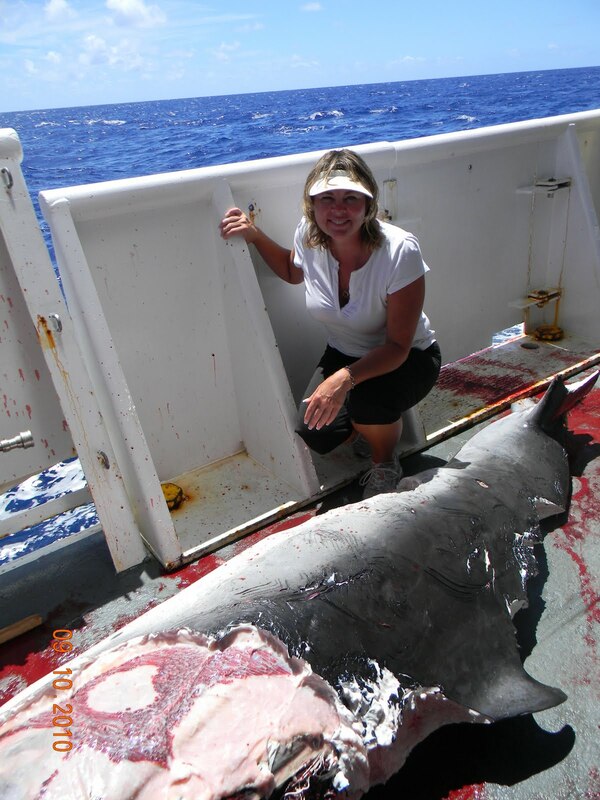 This entry was posted in 2010, Donna Knutson, NOAA Teacher at Sea and tagged chlorophyll abundance., conductivity for measuring salinity, depth, Hawaii\, HICEAS, Kogia, Oscar Elton Sette, pectoral fin, sperm whale, temperature. Bookmark the permalink.